Lovely, regular, gourmet-like 100% blend of Arabica in easy-to-prepare coffee. When aromatic roasted coffee bean, green coffee extract and green tea extract are combined, we’ll get a rhapsodic fusion that is energizing and warming - a perfect addition to your weight loss program which include exercise and a balanced and healthy diet. The trifecta elements help to support your energy to maintain an active lifestyle. 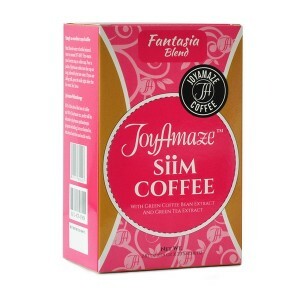 JoyAmaze™ Siim Coffee is a low calorie coffee that is decadent on its own.